BEIJING — Beijing is installing radar facilities on its artificial islands in the disputed South China Sea, an American think tank has said, in a move that could “significantly change” the operational landscape. Satellite imagery of Cuarteron reef in the Spratly islands released by the Washington-based Center for Strategic and International Studies (CSIS) shows what appears to be a high-frequency radar installation, as well as a lighthouse, underground bunker, helipad and other communications equipment. The photographs come only a week after US officials said China had deployed surface to air missiles in the Paracel islands further north, and with tensions mounting in the strategically vital region. “Placement of a high frequency radar on Cuarteron Reef would significantly bolster China’s ability to monitor surface and air traffic coming north from the Malacca Straits and other strategically important channels,” said CSIS’s Asia Maritime Transparency Initiative. 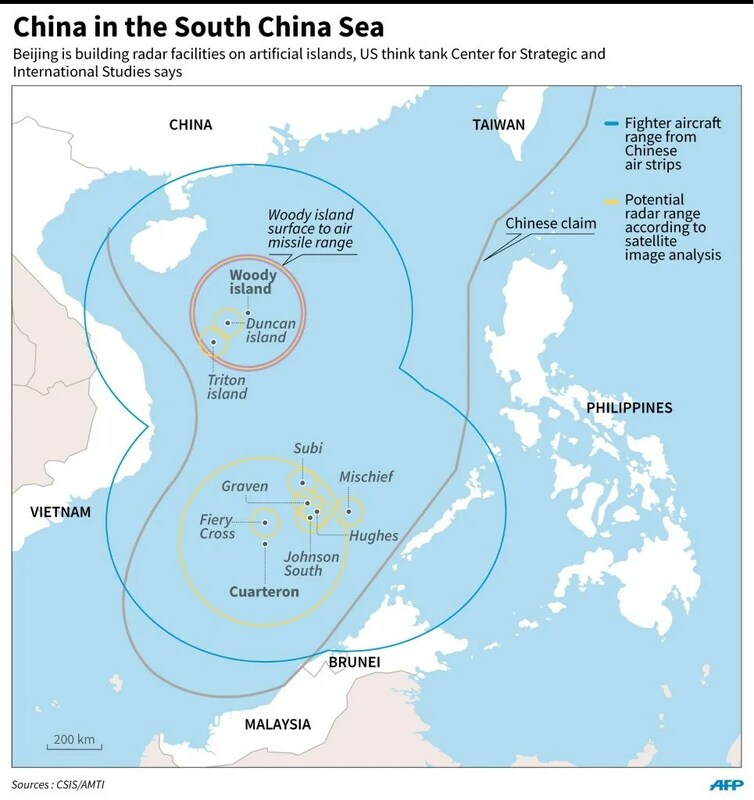 Images of other small reefs nearby which China has transformed into artificial islands — Gaven, Hughes, and Johnson South — revealed other features identified by CSIS as possible radar towers, gun emplacements, bunkers, helipads, and quays. CSIS said that while the earlier deployment of HQ-9 surface to air missiles was “notable”, it “does not alter the military balance in the South China Sea”. The US has in recent months sent warships to sail within 12 nautical miles — the usual territorial limit around natural land — of a disputed island and one of China’s artificial constructions in what it says is a defence of the right to free passage. Beijing claims almost the whole of the South China Sea — through which a third of the world’s oil passes — while several other littoral states have competing claims, as does Taiwan. Last week China confirmed it had placed “weapons” on Woody Island in the Paracels, defending what it said was its sovereign right to do so. Beijing says it defends the right to freedom of navigation, and insists its island building aims to provide public goods, such as search and rescue facilities, but maintains it has the right to deploy necessary “self-defense” capabilities. Chinese foreign minister Wang Yi was heading to Washington on Tuesday for talks with US Secretary of State John Kerry, where the issue was expected to be on the agenda. US President Barack Obama last week called for “tangible steps” to lower tensions in the region.